The National Bike Challenge is offered FREE to all individual riders, workplaces, teams and schools. The Challenge period is May 1 through September 30; results are tracked daily on the website. It's easy to sign up, and by entering your local zip code, you will automatically be signed on to the local host, Bike Chico, serving Butte and Glenn counties. Points are awarded for riding daily as well as number of miles. So even if you only ride a mile or two each day, your points will add to the local pot. Get your co-workers, friends and family to form teams and sign up at the www.nationalbikechallenge.org Track your miles and follow your competition. 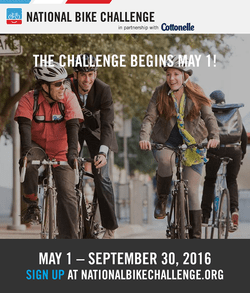 Register for FREE at www.nationalbikechallenge.org. You can manually log your miles or download one of the free mobile apps (MapMyRide, Endomondo or Strava) and your miles can sync automatically. Whether you bicycle for transportation or recreation, you earn points for riding. You (and your associated teams, schools or workplaces) receive 20 points every day you ride 1 mile or more and every additional mile earns a point per mile. Every pedal counts! Points from riders from each community with Butte and Glenn Counties are also tabulated automatically.